Rensselaer Polytechnic Institute researchers have determined that nanoblades, a novel nanomaterial, can store and discharge hydrogen rapidly and at relatively low temperatures when compared to the same kind of materials. They can also be recharged for numerous times. These properties of nanoblades make them suitable for hydrogen storage applications in future-generation hydrogen-powered or fuel cell automobiles. The National Science Foundation financed the research. The researchers originally developed the magnesium-based nanoblades in 2007. Nanoblades are asymmetric being exceptionally wide in one dimension and thin in another dimension, making them to have huge surface areas. They also have 1 µm space in between each of them. These aspects make them suitable for hydrogen storage applications, said Gwo-Ching Wang, who serves as Professor of applied physics, astronomy and physics at Rensselaer. The researchers fabricated the nanoblades by employing oblique angle vapor deposition technique that constructs nanostructures through the vaporization of a material such as magnesium and the subsequent deposition of vaporized atoms at an oblique angle on a surface. The fabricated materials are then coated with a metallic catalyst (palladium) to capture and store hydrogen. During the study, the researchers observed that the nanoblades started discharging hydrogen at a temperature of 340° K or 67° C and they released the stored hydrogen within 20 minutes when the temperature was raised mildly to 373° K or 100° C. They also discovered that the nanoblades can be recycled, i.e. they can be recharged after release of hydrogen and used repeatedly. 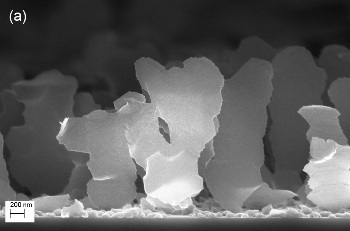 By employing temperature programmed desorption (TPD) and reflection high-energy electron diffraction (RHEED) method, the nanoblades are fitted onto an ultra-high vacuum system integrated with a thin-film deposition chamber and a high-pressure reaction cell, the scientists discovered that the nanoblades can be reused for over 10 cycles of hydrogen absorption and discharge. The researchers will continue their research to enhance the nanoblades with various polymer protective coatings and catalysts to optimize their performance and improve the count of hydrogen absorption and discharge cycles.